I like cross country – I like to run. It can be a bit hard to run around the field. Also I like football dribbling and shooting. We also did passing to other people on the team. And we did penalty shooting to the goal keepers. In our maths lesson we do times tables, subtraction and addition. I love doing maths to help me learn about new things that I haven’t learnt. I find maths difficult because division is so hard. I love maths lessons though because we play elevens which is a fun maths game. Maths lessons are hard even though I love them! Last week on Tuesday I went to 11+ club. We were doing algebra. Some of it I didn’t understand but I tried my best. Mr Jamieson was teaching us algebra. I found it interesting. 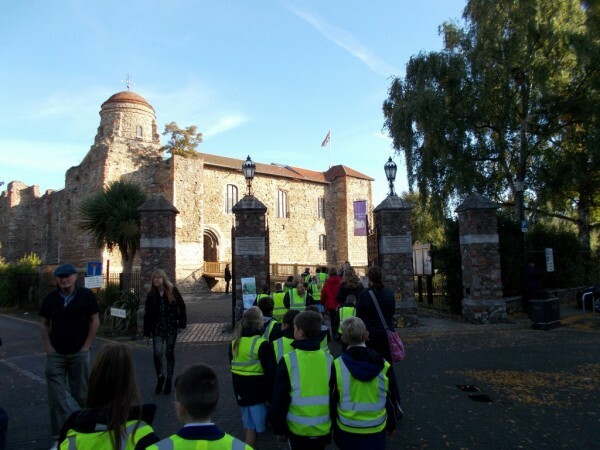 This week Year 5 went into Colchester to learn more about our geography topic local area. In this trip we saw 4 different Colchester landmarks- Castle Park, Holly Trees Museum, Jumbo Tower and Colchester Castle. We learnt new things in every area. On Tuesday the 18th of October, 5A will be doing another fascinating science experiment. We will be mixing baking soda with vinegar and seeing which gas it makes and how it blows a balloon up. There will be loads more science experiments – don’t miss them. In Rugby Club we practice our skills and to get up a level from people who don’t. Mr Dowson and Miss Banks run it and it is fantastic. It is every Thursday 3.30 pm to 5.00 pm. It is for Years 4,5 and 6 and it is very popular. All together I think it is amazing!